Warranty Information: Guardian® products have a limited lifetime warranty against defects in materials workmanship with the exception of the folding cane, walker footpieces and hand-held shower kits, which are warranted for one year. This warranty does not extend to non-durable components, such as but not limited to, rubber accessories and grips which are subject to normal wear and tear and replacement. in the event of a defect covered by this warranty, we will at our option repair or replace the product. Supports Weight. Safe. Lightweight. Easy To Use. Well Constructed. Compared with local 'hospital outlet,' and found similar pricing that ranged $290 - $400. I am a personal user and not associated with any medical supply source in any way. Nor do I begrudge 'reatil' locations their prices, they have different overhead than where I purchased. Supports Weight. Safe. Easy To Use. Well Constructed. Elderly. Need security for walking. Very helpful . Just reached the point where I some times need a little help getting around . Supports Weight. Safe. Lightweight. Well Constructed. Stores Easily. Easy To Use. I bought this rolling walker for my elderly mother. It is everything the manufacturer says it is. The walker allows my mother to move around in tight spaces and the braking system works fine.It is easy to fold up and store and the basket holds everything from newspapers to food and beverages. I bought this walker on sale and the price was much cheaper than the medical rehab stores. Supports Weight. Safe. Easy To Use. Well Constructed. Stores Easily. won't fit in trunk of car. won't fit in trunk of car. Will fit in back seat car. Will fit in back seat car. Will fit in back seat car. Long Distances. Outdoors. Short Distances. daily walks. daily walks. field trips. grocery store trips. user's husband. Need security for walking. Caregiver. Elderly. this is to enable husband. Gift giver. husband using it for daily walks around the neighborhood and to take a field trip to the museum and as an aid going to the grocery store. by Stan the Man from Eatonville, Wa. Supports Weight. Safe. Lightweight. Easy To Use. Well Constructed. Stores Easily. sturdy. Multiple Sclerosis. Need security for walking. Long Term User. Back Fused X 3. I purchased my third one. Use daily indoors and out. Great in all situation I have used it. I need place to sit and regain strength and energy but not a wheelchair. DO use a motorized scooter for lengthy trips ie longer than half a city block. I recommend to anyone. The Brand is sturdy. My first one is still in use by a friend. One by another maker was purchased by insurance. This brand far superior, returned the other and purchased this model WITH MY OWN RESOURCES BY CHOICE, due to the quality. 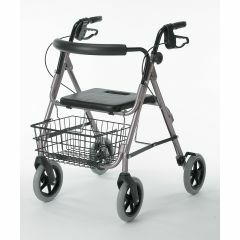 I would like to purchase a padded backrest and cargo basket for my Guardian Pro 400 series rolling walker. answer to my question please. what is the difference to the five guardian 480 walkers that comes up on the computer at difference price. Asked on Jan 31, 2014 12:34:18 PM by I don't use face book only e-mail from what is location??????????? DO YOU SHIP BY DHL AND APPROX WHAT IS THE COST? what is the weight cap. ? This walker will be for someone 6'3. Is it able to be adjusted higher for a tall man? Asked on Jan 9, 2012 8:59:16 PM by Chris from Riverside, Ca. what do the letters CE mean on a walker? My mother's Guardian 480 walker severely cut my mother's arm when she pulled her hand back from placing something through the walker. She crocheted handle covers to cover the sharp under edge of black rubber handlebar. Hers is not new. Has this defect been corrected? is it easy to fold up and carry in an automobile? I can easily fold it and put it in the trunk.